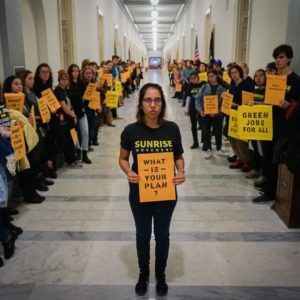 Join the Sunrise Movement for an action at the San Francisco office of Rep. Nancy Pelosi to memorialize the 85 people who died in the recent wildfires. Participants will carry items that represent what they are fighting to protect from the climate crisis and share stories of why they are in this fight. The action will also demand that Pelosi “take action in alignment with what science and justice demand,” specifically, support Alexandria Ocasio-Cortez’s Green New Deal proposal for an emergency mobilization for an equitable clean-energy economy.